Whenever Pyreheart Wolf attacks, creatures you control gain menace until end of turn. You really want to pump up Judith's ping ability? How about some poison? Grafted Exoskeleton , Glistening Oil , and Phyresis will make judith a scary lady. you can cast Tainted Strike in response to a board wipe to more than likely kill a player. On the subject of getting more out of your creatures, try some of the undying or persisting creatures. Geralf's Messenger , Pyreheart Wolf , Flayer of the Hatebound , and Mikaeus, the Unhallowed will come back stronger. the other side of that, Murderous Redcap , Furystoke Giant , Puppeteer Clique , Thunderblust , and Rattleblaze Scarecrow all come back weaker, but come back for free, which is nice. Other than that, I agree with a lot of what multimedia suggests. SamsWrath on The Scorpion God "Non Budget"
Louivillain23 on Off With Her Head, Marchesa! Your deck is gonna be stagnant if Marchesa isn't protected so I'd suggest Lightning Greaves to protect her. 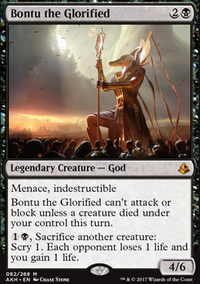 I'd also suggest Grim Haruspex, Disciple of Bolas and Sage of Fables for some reliable card draw. 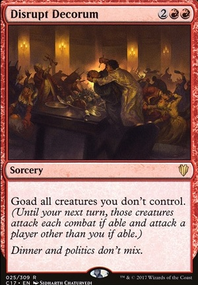 Your deck also seems to want to be aggressive so cards like Exava, Rakdos Blood Witch and Anger to have more cards that grant haste to capitalize on an open opponent. Also dealing with combat you can have some extra evasion with stuff like Profaner of the Dead and Pyreheart Wolf. If you want to delve more into the realm of taking other people's creatures then Molten Primordial would be great. Last but not least Marchesa, the Black Rose and Mikaeus, the Unhallowed puts anything that dies into a recursion loop, so another way to abuse that is having a creature infinitely die while Deathbringer Thoctar or Stalking Vengeance is out to throw infinite damage at everyone for a W!!! That's all I got, Happy Brewing!!! I'd say that your ranking of the 4 options is pretty accurate. You missed Smothering Abomination though, which is my number 2 pick I think, especially where it is a sac outlet in a way. 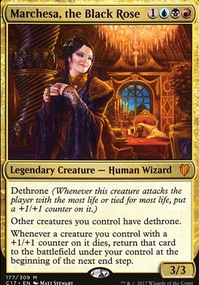 Having flying also means it's a bit easier to get dethrone triggers with it if you need to. I'm currently using Grim Haruspex because it's 3mana and has some wizard synergies, but smothering abomination is very high on my list of potential changes. Midnight Reaper would be a good include if you needed more life loss cards, or if you needed more card draw and didn't want something like Necropotence. personally i have no issues on those fronts so I've opted to go for the cards i have here. midnight reaper is definitely a good option if you're looking for a low CMC card draw effect to replace Harvester of Souls or river kelpie. The thing with persist is that other than Glen Elendra Archmage there are only two other creatures that are even worth considering. River Kelpie and Puppeteer Clique. the rest are basically just vanilla creatures essentially in that they have no abilities or other interactions with the deck's gameplan. as i mentioned before, haruspex is just a more efficient effect than kelpie, 2 less mana is a lot. and i ran clique for a while actually, but i just rarely found myself making good use of the reanimation effect and so i dropped it for something else. Anything > CMC4 has to be particularly good in my opinion, otherwise it's tough to play in a deck like this since we don't have the ramp that other (Green) decks have available. being able to get the most out of your mana each turn is a big big factor in how effective your deck is. Undying is obviously much stronger than persist, but again, there's only really about two cards worth bothering with here. a card which doesn't do more than one thing isn't usually a good pick in my opinion. a creature like Sightless Ghoul which is basically just an attacker with no really notable abilities isn't worth running when its only significant synergy with the deck is that it's hard to remove. 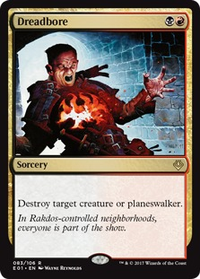 cards like Rakdos Cackler are a much better way to get the same effect. as for undying cards Pyreheart Wolf and Flayer of the Hatebound are the two (other than mikaeus). flayer is too expensive at 6CMC where all he does is give some incidental damage that can just as easily come from attacking. 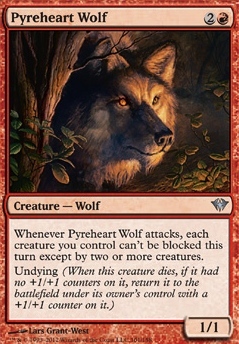 pyreheart wolf might be a decent include, but since i'm running a lot of cards like gravepact and such i can keep the board fairly clear and don't have to worry too much about blockers. i find that glen elendra archmage is a very strong card in the deck though. flying makes dethrone easy and like you said, sage of fables makes it a great soft lock. metallic mimic isn't worth it for me since my tribal synergy is pretty light. i have about 7 wizards and nothing else really overlaps much, but if you focus a bit more on the wizard theme though then it would be a great include for sure. feel free to look at my queen marchesa deck if you want. it's public on my profile i believe. Saw your post on Reddit! Lantern of Insight is a must have. Cloak and Dagger is a great equipment that automatically attaches to grenzo. Magus of the Wheel could be replaced with Sensation Gorger for that tasty tribal zest. Dolmen Gate is awesome for protecting your attackers. if Blood Moon or Magus of the Moon are within your budget, I highly suggest them. they are great on their own, and with Goblin King, all of your goblins are unblockable. If you wanted to make this deck more competitive, I would move away from goblin tribal entirely. 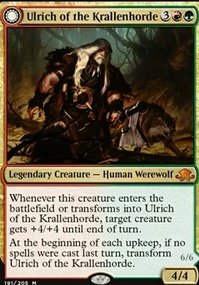 Krenko is really the best commander for goblin tribal and any deck with him in it just becomes a Krenko deck. 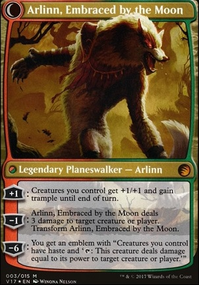 There are awesome cards outside of goblins such as Pyreheart Wolf, Neheb, the Eternal, and Rapacious One that would really make the deck shine. those combined with mana doubling artifacts and a few stax elements such as Smokestack, Urabrask the Hidden, Stranglehold, Heat Stroke, and War's Toll make for a quite strong deck. Last but not least Rite of the Raging Storm, Bitter Feud and Crown of Doom are my pet cards for this deck. You won't be disappointed if you choose to include them.